“Jane Elliot on Race and Racism,” presented by the university’s Institute for Child Development and Family Relations, will take place in the Santos Manuel Student Union Events Center. 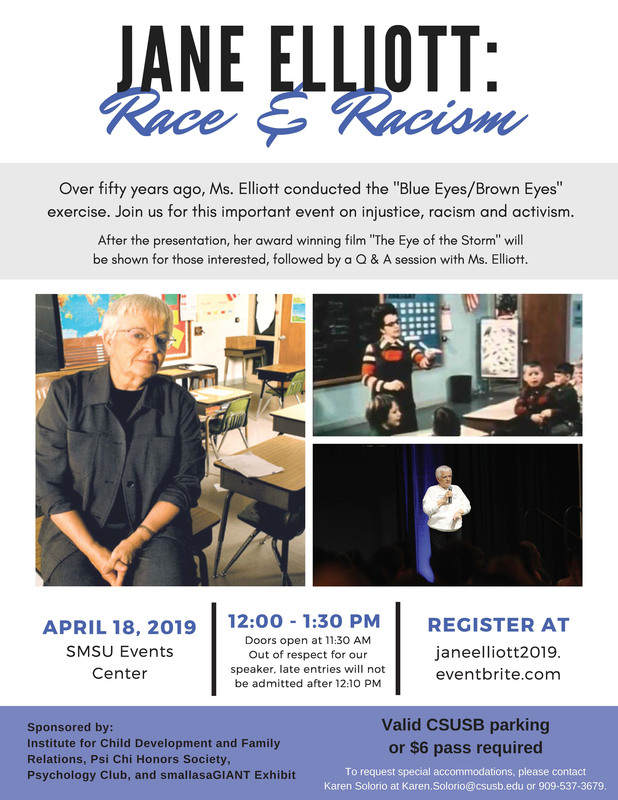 Jane Elliott, who in 1968 developed a classroom activity for her all-white class of third graders to teach them about discrimination and racism by separating those with blue eyes from those with brown eyes, will speak at Cal State San Bernardino on Thursday, April 18. “Jane Elliot on Race and Racism,” presented by the university’s Institute for Child Development and Family Relations, will take place beginning at noon in the Santos Manuel Student Union Events Center. Her talk also complements the Anthropology Museum exhibit “smallasaGIANT,” set to run April 15-June 15. The public is invited to the free event; parking at the university is $6. However, because of the high demand for this program, all attendees must register at the Jane Elliott: Race and Racism webpage on Eventbrite at janeelliott2019.eventbrite.com. Elliott, who developed what has become known as the “Blue Eyes/Brown Eyes” exercise after the assassination of civil rights leader Martin Luther King Jr., will show how people can to recognize and identify disparities in the ways in which power is assigned and maintained. No longer a classroom teacher, Elliot now works as a diversity trainer and lecturer who is recognized most prominently as an anti-racism activist and educator. She has been the focus of two television documentaries, “Eye of the Storm” in 1971 and “A Class Divided” in 1985, and has received many awards, including the National Mental Health Association Award for Excellence in Education. Both documentaries focused on what Elliot did with her students the day after King was killed. Elliott spoke to her class about racism, but felt that her students, all from the small Iowa town of Riceville, didn’t comprehend how harmful racism could be. She asked her students if they wanted to participate in an exercise to see how discrimination worked. The students agreed. The next day, she separated the children with blue eyes from the children with brown eyes. The blue-eyed children were told they were the superior group and given extra privileges such as more food portions at lunch, more playtime and they sat at the front of the class. The blue-eyed children were encouraged to play only with other blue-eyed children and ignore those with brown eyes. The brown-eyed children wore collars made of fabric to identify them as a minority group and made to sit in the back rows. Elliott also reprimanded the brown-eyed students when they made mistakes or didn’t follow the rules. The brown-eyed students initially resisted the notion that the blue-eyed students were better, but Elliott deliberately lied, telling them that the melanin responsible for making the students blue-eyed also gave them higher intelligence and learning ability. As the activity progressed, the blue-eyed students became arrogant, bossy and otherwise unpleasant to their “inferior” classmates. Their grades also improved. The brown-eyed “inferior” classmates changed into timid and subservient children, who isolated themselves during recess. Even their studies suffered. The following week, Elliott reversed the exercise, making the brown-eyed children superior. While the brown-eyed children did taunt the blue-eyed ones in ways similar to what had occurred the previous day, it was not as intense. At the end of the exercise, the students were asked to write down what they learned. The students wrote that it was not right to be judged by the color of their eyes and that the color of their eyes did not make a difference on the type of person they were. The children’s compositions were printed in the local papers and the story was picked up by the national news media. The story led to Elliott being invited to be a guest on “The Tonight Show Starring Johnny Carson” to talk about the exercise and the children. After her appearance, the “The Tonight Show” received hundreds of phone calls and letters, many of them complaining. But not all the reaction was negative. As more people learned about the exercise, Elliott was asked to repeat it, and the activity eventually evolved into professional training for adults. In 1970, Elliott staged the exercise for adults at a White House Conference on Children and Youth. Since then, Elliott has continued to do the Blue-Eyed/Brown-Eyed exercise, which is considered as the basis for diversity training. She has done training for corporations including General Electric, Exxon, AT&T and IBM. Elliott has also given lectures on diversity to the FBI, IRS, the U.S. Navy, the U.S. Department of Education and the U.S. Postal Service. No stranger to Cal State San Bernardino, Elliott presented a diversity lecture on campus in 1998 as part of the Conversations on Diversity lecture series, as a guest speaker for psychology social sciences classes in 2014 and 2015, and returning in 2016 and 2017 for campus-wide presentations. Visit Jane Elliot’s website for more information about her work. For more information on the program, contact the Institute for Child Development and Family Relations at (909)-537-3679 or icdfr@csusb.edu.